Springboard | The sustainable way to fat loss? Don’t diet! A controversial heading for this blog, but one I feel very strongly about. I talk from personal experience when I say diet’s aren’t sustainable and thus ineffective for fat/weight loss. I have tried a variety of diet’s (in my strive for that cover model six-pack which kept avoiding me!) from the trendy low carb diets all the way through to the weird and wacky juice diets. All had an effect on my body fat/weight albeit a short term one. Why? The key word here comes to sustainability. [subscribelocker] Why go through the torture of a diet if the results don’t last? More often we revert back to a position worse than when we started. But, you will be pleased to know, there is a more sustainable way and all it takes is a bit of maths and some discipline. However it sadly isn’t that simple and we need to be a bit more scientific/mathematical with our approach. The great thing is, the maths is not difficult and I am going to tell you exactly what you need to do. But why do we have to do this? Well everybody is different and we need a plan that is specific to us and we must take into account key variables such as gender, age, activity levels etc…so that we have something highly applicable and bespoke to us, not our mate who lives down the road who has the body we want but runs 30 miles a week and is 10 years our junior! It is critical to understand based on your age, gender and activity level, how many calories you require per day to simply stay alive. This is known as your Basal Metabolic Rate (BMR). Reference: Dietary Reference values for Food, Energy and nutrients for the United Kingdom. HMSO (1991). Thomas B and Bishop J. (2007) Manual of Dietetic Practice, Fourth Edition; Blackwell Publishing. From this amount, roughly 30% should come from fats (11% from saturated fats, the rest from unsaturated), 15% from protein and 55% from carbohydrates. These are generalised figures based on healthy eating guidelines which will suffice most of the population however naturally there will be slight variants for specific people. I will blog about the importance of food ‘quality’ in future articles but for now, this guidance will help you hugely with your weight management goals. Armed with this figure, we can now move to step 2 and plan how we can produce a calorie deficit. 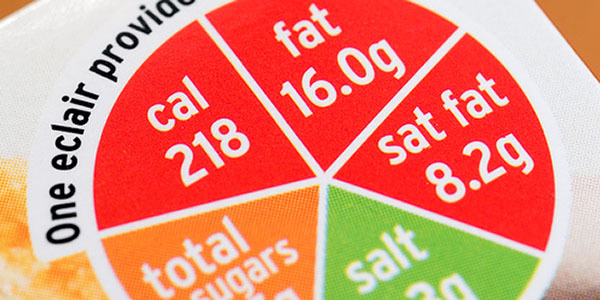 The food industry has come on leaps and bounds over recent years and now it has even become a legal requirement to provide certain nutritional information on food packaging and in turn making our lives easier to keep track of our intake of calories. Now don’t get me wrong, there is a little bit of hard work involved here but if you are determined to lose weight then it will be a worthy exercise to do. The great thing is that we have the internet to help us with working out the calorie amount for anything we eat. A simple Google search will provide you with this information within seconds for almost every food we eat. As an example, for lunch I have an egg and cress sandwich which will contribute 324 calories to my daily amount. This information was provided on the front of the packaging. Easy. In time, you will get a better understanding of what foods contain what calories. I don’t spend all day looking at food labels, it is just something I now do subconsciously. 2. Exercising (see point 3 below). Between the 2 elements, you will be looking to create a daily calorie deficit of 500 k/calories. This can be any combination but the ideal scenario would be 50% / 50% whereby you eat 250 less k/cals and then burn 250 k/cals through exercise. This way you don’t have to starve yourself or go crazy at the gym. It is much easier to adhere to and thus, sustainable. Exercise, as I mentioned in last week’s fitness blog, doesn’t have to be long and arduous for you to get results. You just need to do it regularly and give it your all when you do it. Exercise fires up the body and naturally this causes a spike in calorie burning as the body uses the energy to perform the exercise. I have already introduced the concept of Tabata cycling (4 minute workout) which will be one form of exercise which can push you towards your calorie deficit goals and I will be blogging about many more going forward. Each which can quite comfortably help you burn 250 + calories. This morning, I completed a 12 minute cooper run on the treadmill (with a 2 minute warm up and 2min cool down). Here I was able to observe my calorie expenditure on the dashboard and I hit just over 300 calories. Not bad for 16 minutes exercise and the great thing now is that I will continue to burn a good deal more calories throughout the day as the ‘after burn effect’ kicks in. I now don’t need to starve myself to the point of insanity. Instead I will fuel my body with the correct amount of nutritious, balanced food to ensure I have the energy to make the very best of the day ahead (more information on power foods in future blogs). Weight management / fat loss is something that I get asked about all the time. It has to be the single biggest desire/goal for 90% of the people I talk to and work with. The internet is littered with magic formulas for weight loss but for me they all come with a price, they simply cannot be sustained. The real magic formula is simply keeping tabs of energy in and energy out, eating is an important part of weight management so long as the food is nutritious, controlled and combined with regular exercise. So start putting this into action because without action we won’t get results. Workout your daily calorie requirement, take note of the calories you intake and then plan some regular exercise to ensure you produce that deficit. A few dedicated and consistent months and you will really start to see and feel the positive effects. I am more than happy to answer any questions you may have, just post them at the bottom of the article and I will do my best to respond within 24hours. Thanks Tom, it’s so rich of info. I’d be interested to know how long you need to eat before and after working out and what food is the best recommended for maximizing performance. There are a number of thoughts when it comes to timing and content of meals and something I will be blogging about more over the course of 2014. It is a very interesting topic of discussion. Regarding an answer, my question to you would be what are your key fitness goals? Lose weight, increase muscle, improve stamina etc…? As this will determine the outcome of how and when to fuel yourself for optimum performance.